August 2014 – He Said What?! Author hesaidwhatksPosted on August 30, 2014 February 28, 2016 Categories Adult Autism, Asperger's Syndrome, Epilepsy, Humor, WorkLeave a comment on I Worked on a House! Last night was a seizure night for Aaron. We are so thankful that he doesn’t have constant daily seizures like our friend’s son, Elijah, has. I told Wendy this morning that I don’t know how she does it apart from God’s grace. I know that each of us who know the Lord depend on His grace for the many circumstances that we face in this life. Having a suffering child is tough. When Aaron has seizures is when I feel most vulnerable emotionally. His autism is high functioning, though in its own way debilitating, but he at least can function. His autism makes him at times very frustrating and it causes him to be in trouble more than we like, both here at home and at his day group. Or then he can also be very endearing and funny, even hilarious. But his seizures……they make me sad. They show me the seriousness of Epilepsy…..the danger. I may be vulnerable emotionally on these days, but he is vulnerable physically. And as his mother, that scares me….and makes my heart hurt. However, I know from experience over the years that I cannot dwell on the scary or on the negative, even when it comes to my son…..my first born. Being aware is one thing. Being defeated with constant worry is quite another. And constant regret……that’s one thing that I very consciously pull my mind away from when it starts down that path. I would love for Aaron to have a normal life, a job, a wife and children…but he doesn’t and he probably never will. Living with regret over those issues only pulls me down and doesn’t do anything to help Aaron. Plus it’s not honoring to God, Who wants me to trust Him in all things. That means ALL. Even Aaron, my son, and my hurt over his pain and difficulties. Aaron slowly made it downstairs this morning after his three seizures. He tried to stay up and awake but as is typical for him, he laid back down on the couch and fell promptly asleep. 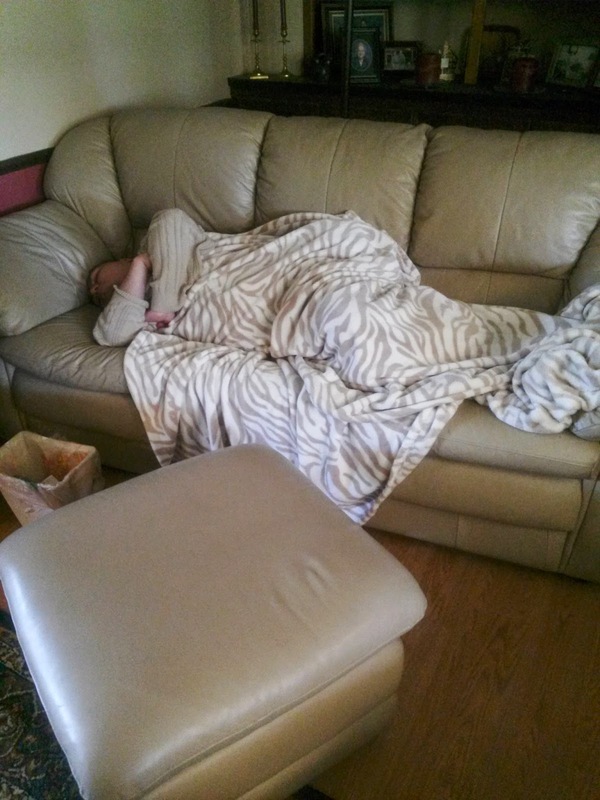 I covered him with his favorite blanket……the animal print blanket…..and he slept deeply until he had another large seizure. Now he is awake off and on, talking about wanting his coffee that he missed this morning……will it still be hot…….when can he have it……worried that he won’t get to drink it……typical Aaron. Earlier, while he slept and with me being unable to leave this area of the house for fear of another seizure, I stood at the kitchen sink. I was washing the produce that I had gathered in the garden yesterday evening before dark. 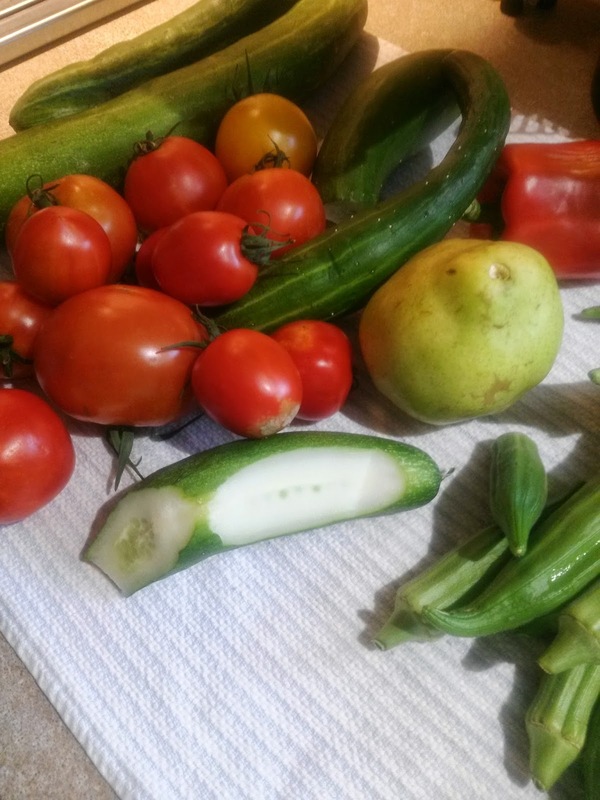 Some tomatoes…..okra…..a red pepper……one pear that I was able to reach from our pear tree……and a few stray cucumbers. On one of the cucumbers I saw the unmistakable signs of worms. The brown, crusty spots on the outside of the cucumber were my clue, so I grabbed a paring knife and cut into the peel. Yep, there it was…..a yucky worm……and then another nearby. 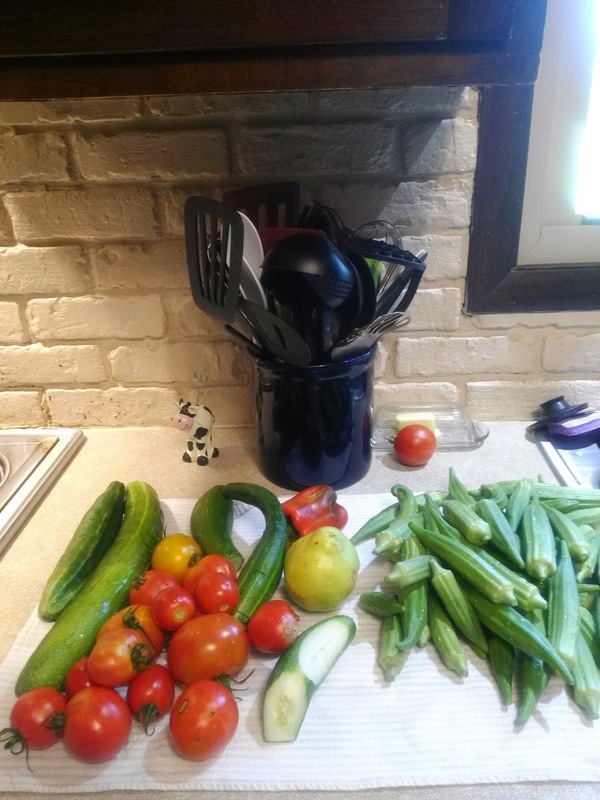 It was tempting to just throw the whole cucumber away, but I’m pretty thrifty about my garden produce that we’ve worked hard to raise. There was still plenty of good left in that cucumber, so I washed the remainder and put it with the other healthy produce. Aaron loves cucumbers, so he can eat it later. This might sound strange, but Aaron’s a lot like that wormy cucumber. He has his issues…..his “worms”……..that disrupt his life. 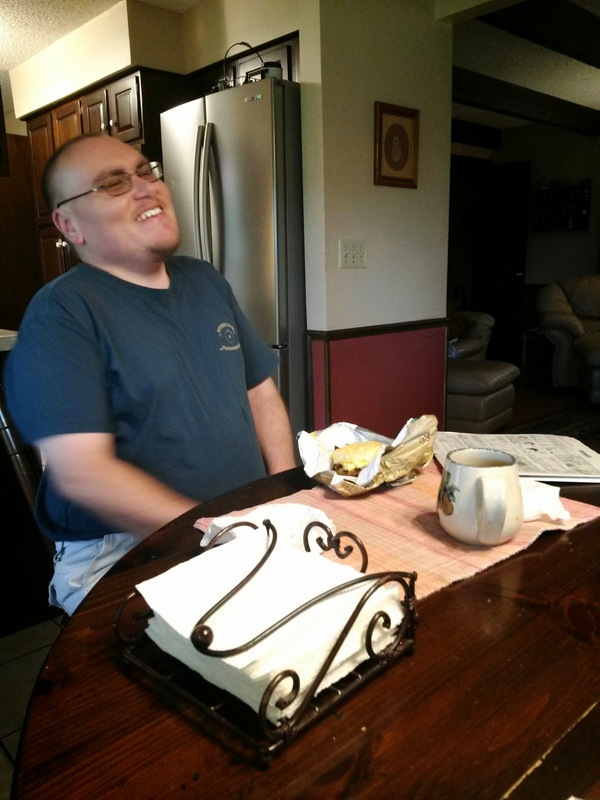 The autism….the Epilepsy……they have completely changed his life from what we thought it would be. When placed beside his sister and brother, we can see a stark contrast. Andrea, a scientist and geneticist in a major lab……and Andrew, working on a professional NHRA pit crew. Their lives are dreams come true for both of them. We love hearing about their work, even when we don’t understand half of it. It’s exciting and fulfilling for them. I love how God gives me what I need, when I need it, from His Word. He lifts my head to look not only up to Him, but to look at Aaron with new eyes……eyes of faith and trust in the God Who loves Aaron and loves us. God has a plan for Aaron that is every bit as important and amazing as the plan He has for Andrea and Andrew. We just don’t always measure Aaron’s value that way, but God does. And He reminds me on these days that I need to as well. Aaron……my wormy cucumber……just in this little area of my house, God has once again spoken to my heart. Friend who is suffering today, never doubt God’s plan and His love for you. Let Him be the lifter of your tired head. He does care…..He does have a plan……for all of us. Including my wormy Aaron. My perfect Aaron, with lots of good in him that God is using. Some days I think I’m still on that March or April thing! Then I walk outside and am hit with these typical Kansas August temperatures. UGH! The temperature was 102 today when I took Aaron down to get him a haircut at Great Clips. His name was called quickly because I had signed him in online. It’s always nice to be called fast, probably more for me than for Aaron. I never know what Aaron will say or do while we sit there in that small waiting area……….but I do enjoy the looks on the faces of the others sitting there with us as they try to figure out Aaron. Good luck with that. But today he didn’t have time for hardly a word before his name was called. He stood up and I reminded him to hand me his glasses…….and as always, he stood there and also took off his watch. He would have also given me his ring if he was wearing it. I always wonder if the other patrons are waiting for him to remove his shirts and shorts. The haircut and beard trim went quickly. Aaron answered the hair dresser’s questions but didn’t make any conversation today. I handed the girl his debit card, which she swiped while he was putting on his watch and his glasses. He signed the receipt, humming his monotone hum the whole time, which made both the hair dresser and me smile. Then he grabbed a Dum-Dum lollipop from the gift display on the counter while I took the Great Clips pen from his hand before he stuffed it into his pocket. I know him so well. But not well enough, because while I finished writing her tip on the receipt, Aaron said that he would be right back as he quickly turned and was out the door before I knew it. Oh brother, I thought! And just as soon as I got to the Great Clips door to leave, Aaron was barreling back inside……all smiles……..telling me that he had tried to open the door of the martial arts studio nearby. He has asked and asked and asked about that place, so he decided to grab the opportunity and check it out himself. Too bad it was closed…..for Aaron it was too bad. Not for the unsuspecting people in there who would have been loudly interrupted if Aaron had been allowed to barge in. I must remember this the next time Aaron gets his hair cut………or somehow manage to always take him on Sundays, when the martial arts studio is closed! No, Aaron, it’s the way that you EAT your cheese cubes that gives you diarrhea. More specifically, the amount you eat…….which is the amount you pour in your bowl. OK, maybe it IS the way you pour your cheese that gives you diarrhea. I need to think about that. He’s usually right, in the long run. Sorry for the pun. Speaking of puns and irony, Aaron doesn’t get those at all. He loves to read the comics, at least a few favorites, every day. He read this comic in the paper during supper the other night. I so wish I could describe the conversation between him and Gary as Gary tried to explain it to him. I should have just grabbed my paper and started taking notes right then. Aaron totally didn’t get the comic. I ended up with the remnants of the conversation after supper as Aaron still tried to understand what the bowling pins meant. Well, not really, Aaron. And off I went again, trying to explain it. “I get it! !” the broken record repeated. And I waited. Whatever. Yes, Aaron! Hahaha! Isn’t that funny?! He agreed and we were both happy. Sometimes I just have to come to grips with the fact that he will NOT ever get it…….ever. And he is happy, so I may as well be, too. I got him a new set of sheets last week. He was with me when we found them at Big Lots and he LOVED them. 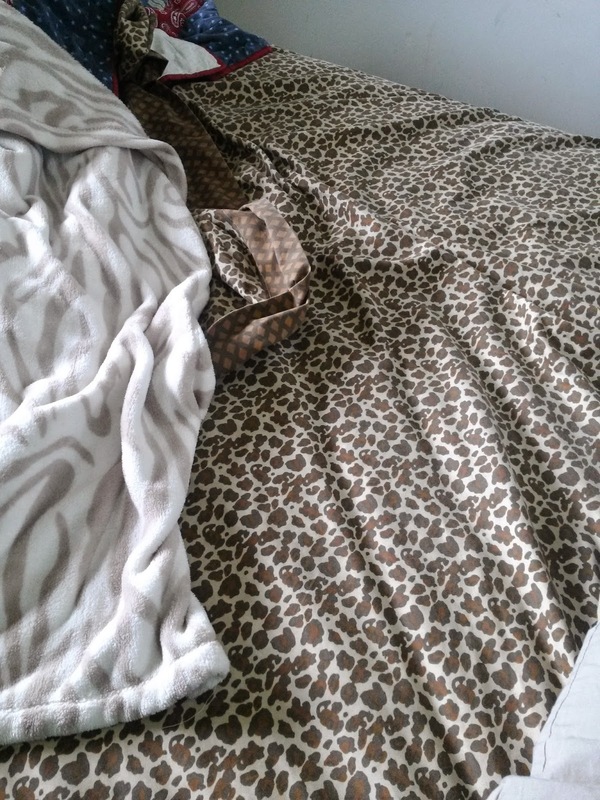 Cheetah print sheets……….right up Aaron’s alley for sure! They went very well with his animal print fuzzy blanket that he loves. I washed the sheets and last Saturday we put them on his bed. He was very happy. But not for long. He came downstairs a couple mornings later and with great disappointment told me that those sheets just didn’t work. I asked what was wrong with them and off we went into the world of Aaron trying to concretely explain the reason that the sheets didn’t work. But he just couldn’t do it. He couldn’t explain what was wrong, even as he used hand gestures and tried to answer my questions. We went up to his bed and I saw that the top sheet had gone way down, so we fixed it and I hoped for the best. The next day it was the same story…..and the next. He said the side came undone. He said the sheet was too big. He said it was the leopard part that didn’t work……although I thought they were cheetah, but I didn’t say that. It was already too confusing. I told him that I thought the texture of the sheets made them slick. “Yeah! !” he agreed. “They slick off of me! !” There! We had it! Finally on Wednesday we just took the top sheet totally off and put on another top sheet. However, the bottom fitted sheet kept wrinkling up……and with Aaron’s tactile issues, this wasn’t working. It was a HUGE relief yesterday to take the sheets completely off and make his bed with a tried and true pair of sheets that I know will work. The cheetah/leopard sheets are cleaned and nicely folded, waiting for the next donation pick-up. I assured him that I have indeed hit my few toes before and it sure felt like I had hit LOTS of toes. And he understood that and he agreed. Wheel of Fortune finished up their Spa Week. Aaron was very interested in just what a spa is and what one does at a spa. 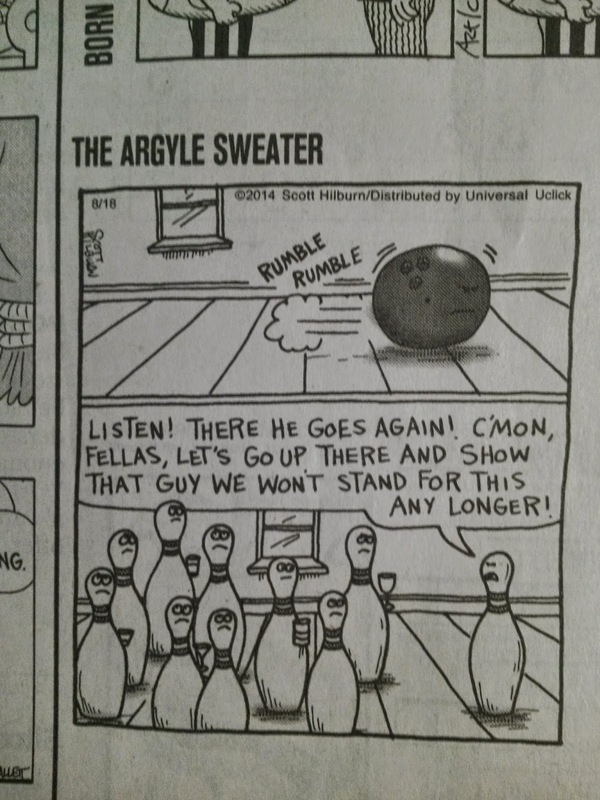 He finally felt like he had a handle on it…….unlike the bowling ball comic……and couldn’t wait to share his understanding with me. I wonder if I want to know what the other stuff is. And I have just written about a lot of “other stuff” that has been our week with Aaron. I could write a lot more “other stuff” but I should stop here…..for your sake. I always have more stuff, trust me, after each day with Aaron. Tomorrow we start a new week. New ups. New downs. New stuff. 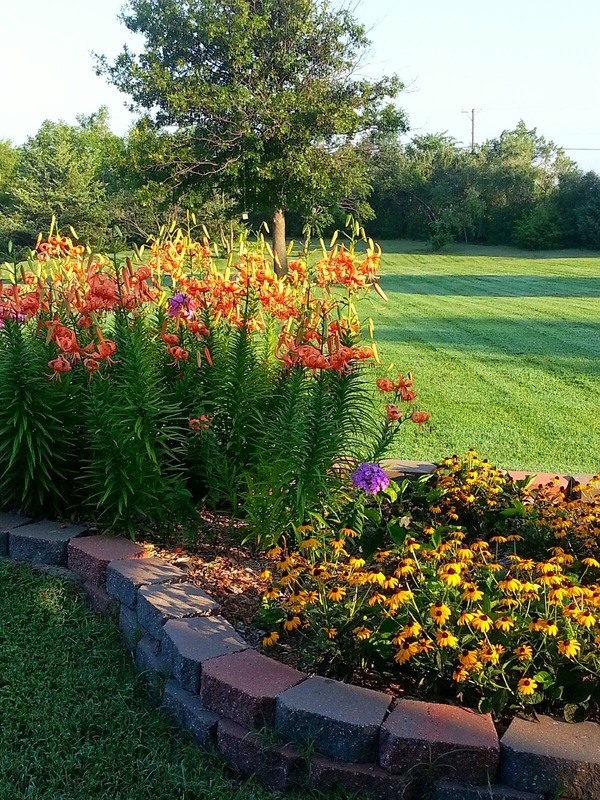 In our back flower beds we have two patches of Tiger Lilies. They were there when we bought this house 15 years ago. Every spring they faithfully poke their shoots out of the ground and quickly grow. Sometime in early to middle July they burst into bloom, with their bright orange color taking center stage for several weeks. This year was no exception, but somehow I thought they didn’t appear to be as strong and as vibrant as in other years. They bloomed later this year, too. They just didn’t seem to be the same old Tiger Lilies that we had enjoyed in previous years. A couple weeks ago we had a thunderstorm during the night. Between having the windows closed, the air conditioner running, and the dulling effect of sleep, it was hard to tell just how strong the wind blew or how hard the rain fell. I got up that morning, and as soon as daylight hit I opened the kitchen blinds. Instantly I saw it……the patch of Tiger Lilies, stripped bare of their pretty petals and standing there with nothing but their fading leaves. The storm had blown off all the petals. They looked stark and ugly in the morning light. 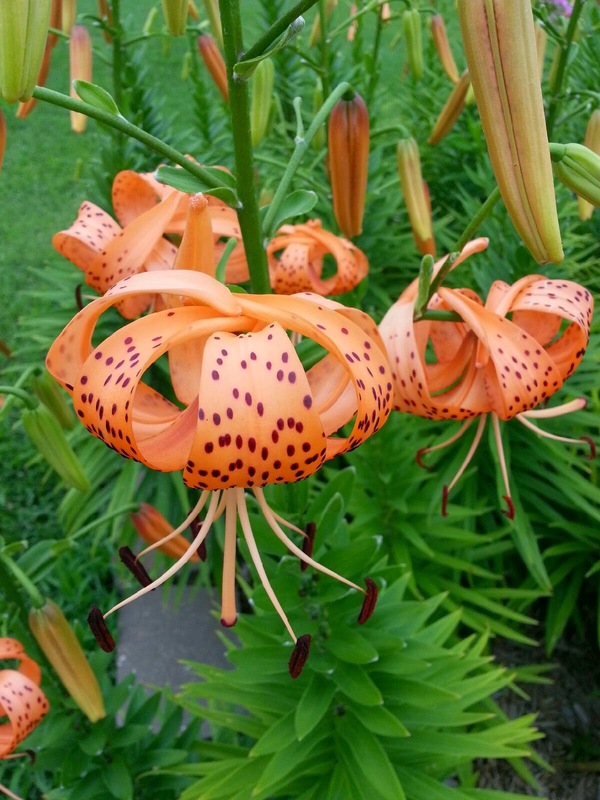 Every single Tiger Lily stalk was stripped bare of its beauty……except for one. There in the midst of all the sad stalks was one lone Tiger Lily that still carried its orange petals. It was actually only one part of a stalk, but there it was, alone with its blooms…….standing tall in the midst of all the damage surrounding it. That lonely Tiger Lily stood there for days, even through several other storms, with its petals intact. And every time I looked at it I thought of a verse and I pondered the lessons that this little Tiger Lily was teaching me. The verse: “Be strong in the Lord and in the power of His might.” And the lessons are many. I’ve never seen a time when so many are so burdened. I see it in the world……ISIS, Syria, Gaza and Israel, Ferguson…..I don’t need to keep that list going. Even the death of Robin Williams hit many people deeply. It’s exhausting to watch the news. I don’t mean to sound depressing, but this is just how life is right now for so many. And even for those of us who walk by faith, who trust in the Lord, who try to lean on Him for our needs…..we can find ourselves overwhelmed and ready to just give up. We feel as battered as my bare Tiger Lilies……like our beautiful petals are just about to turn loose and leave us stark and alone. Why read our Bibles? The words seem empty. Why pray? I don’t feel like God is listening and my mind wanders. Why obey? Where has it gotten me? These are lies of Satan. These are his ways of stripping us of our beauty that Christ has given us, just like my ugly Tiger Lilies that I saw that morning. I find it very interesting that Paul, when he was encouraging the Philippians to keep maturing in their faith, told them to press forward……to forget what’s behind and to reach toward what lies ahead. Listen to this contrast in Isaiah 1, where Isaiah was describing sinful Israel. He said that they had abandoned the Lord and turned away from Him. Guess what that phrase “turned away” means? It means to estrange themselves backward. Going backward…….pulling away from the Lord and going backward instead of forward. 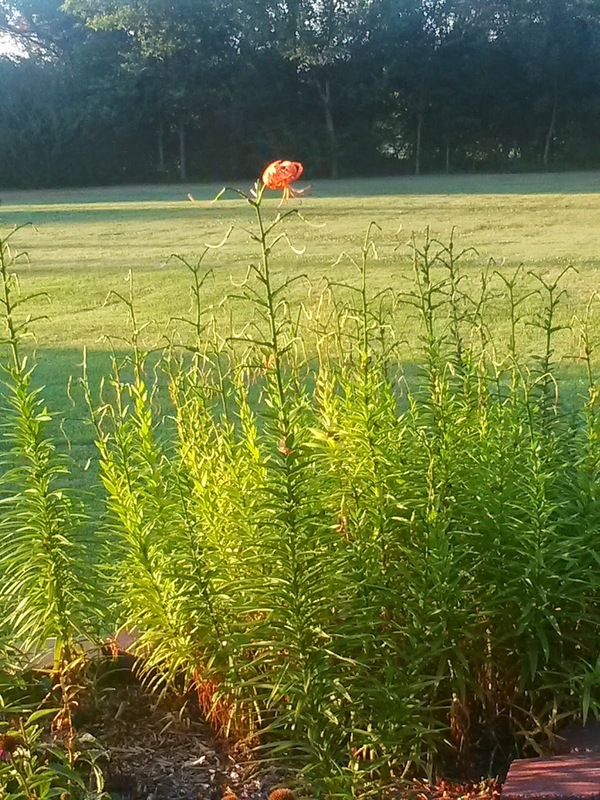 There’s my single Tiger Lily again……standing up and standing strong no matter what was going on around it. Even when all the other Tiger Lilies let go and gave up, this one stood strong…….like he was pressing forward instead of going backward. And that’s what we need to do. Don’t give up when things get tough! Stay true to God…….keep reading His word…….keep praying…….keep obeying…..keep walking in His ways…….keep trusting. We may not feel like it. We may be tired and discouraged. We may even doubt God. But don’t go backward…..keep going forward. Stand tall. Stand strong. Look forward. And keep your petals on! Most of you know that Aaron loves to cut out my coupons on Sunday. Only on Sunday. He will not touch a coupon to speak of on any other day. And I’ve blogged about his insistence that only he can cut the coupons, no matter how tired he is or grouchy he is. Mom is not allowed to touch the coupons because I do not cut them out correctly. He also has his trash can that holds the tiny little clippings from where he cuts the strips of paper into smaller pieces……and the trash can that holds larger pieces of paper……and his carefully orchestrated stack of left over pages from which he cut the coupons……..and then his coupon box in which each coupon is carefully placed. I usually try to sneak a peek at the coupons on Sunday mornings before he sees them. That way I can remove pages of coupons that contain items I won’t buy. This saves Aaron a lot of time. However, he has seen sections of coupons that I am hiding from him when I buy an extra paper……and war breaks out. He insists on cutting them out, no matter how tired he is…..because they are coupons……..and they have dotted lines……..and they must be cut. I cleverly look at the coupons before he gets out of bed, if possible. I hide the coupon pages I remove deep under all the sale papers and stick them in the middle of the newspaper that will be put in the recycle bin later. Sometimes when I am in the middle of this covert mission I hear him start down the stairs, so I hurriedly shove coupon pages here and there as I try to hide all evidence of my trickery. I feel a little breathless and guilty as he enters the kitchen. He hasn’t caught me yet, but I dread the day that he might. Aaron does a little of his own hiding, too. I saw it this past Sunday as I walked through the family room. There under the bench that sits beside where he clips the coupons lay a couple pieces of paper. I leaned over closer and saw that the papers were store coupons. 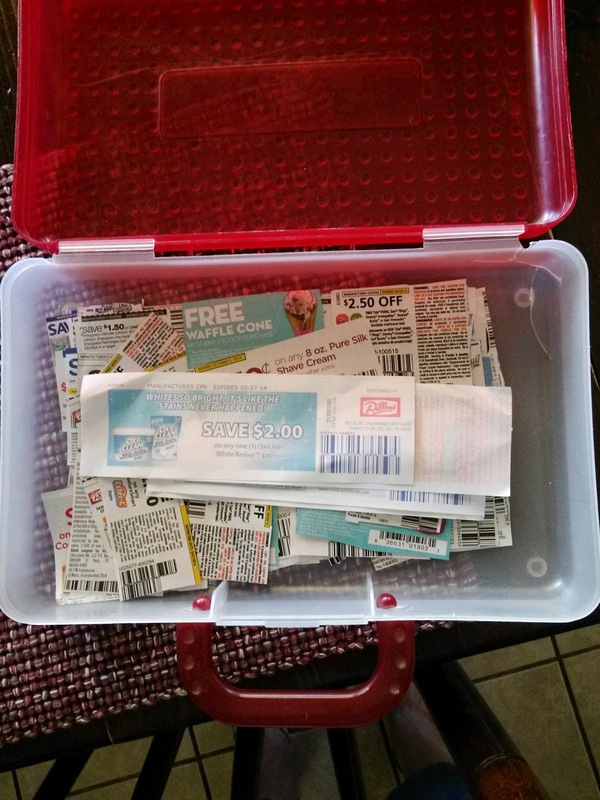 I had put them into the coupon box a couple days earlier………..the coupon box that Aaron uses to hold newspaper coupons. Silly me. Don’t I know better? The coupon box holds the coupons that Aaron cuts……on the dotted lines………just right. Store coupons are not newspaper coupons. Store coupons were not clipped from the coupon pages on a dotted line. 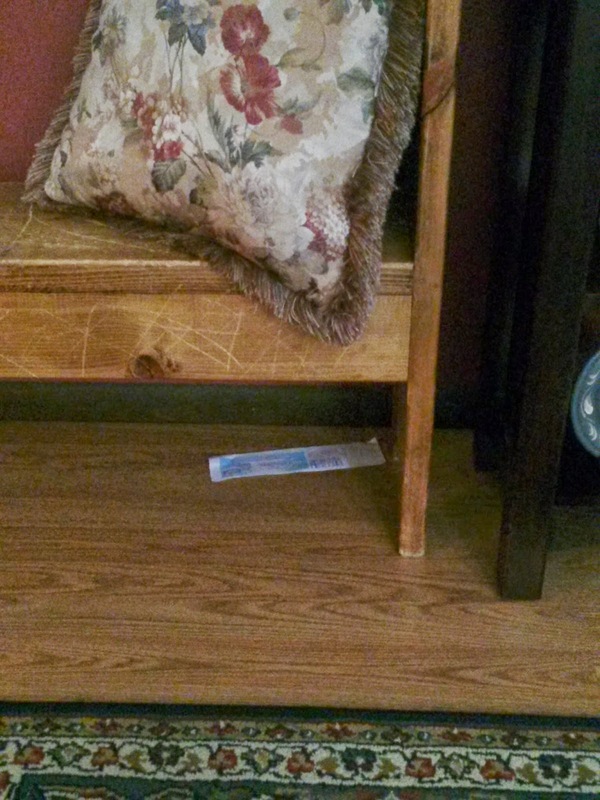 Store coupons have their own place, even if it’s under the bench. 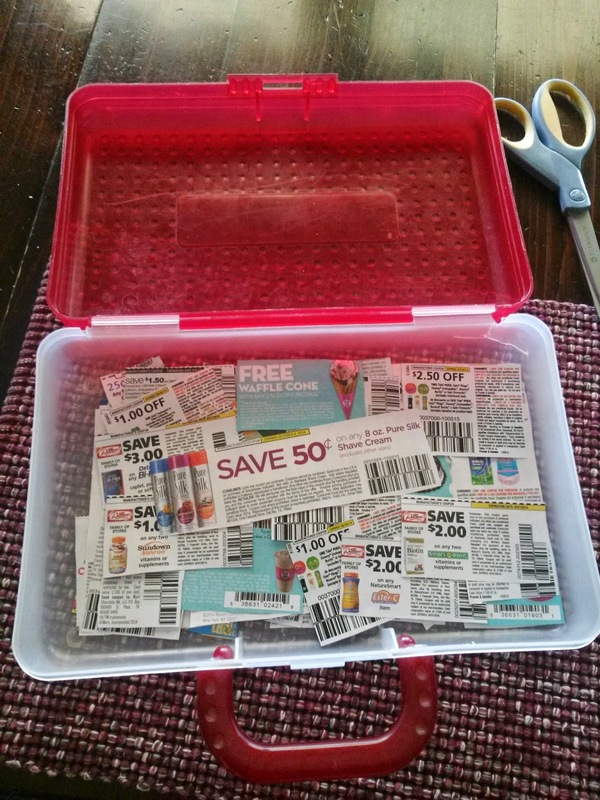 Store coupons do NOT go in the same box as newspaper coupons. But I’m a little devious sometimes. I have put the store coupons back into the newspaper coupon box. Hehehehe! Let’s see what happens this Sunday. Author hesaidwhatksPosted on August 12, 2014 February 28, 2016 Categories Adult Autism, Asperger's Syndrome, http://schemas.google.com/blogger/2008/kind#postLeave a comment on Couponing Done RIGHT! She goes on…….the whole section is excellent and struck a deep chord in my heart. But my mind has been on that caterpillar and butterfly all day. 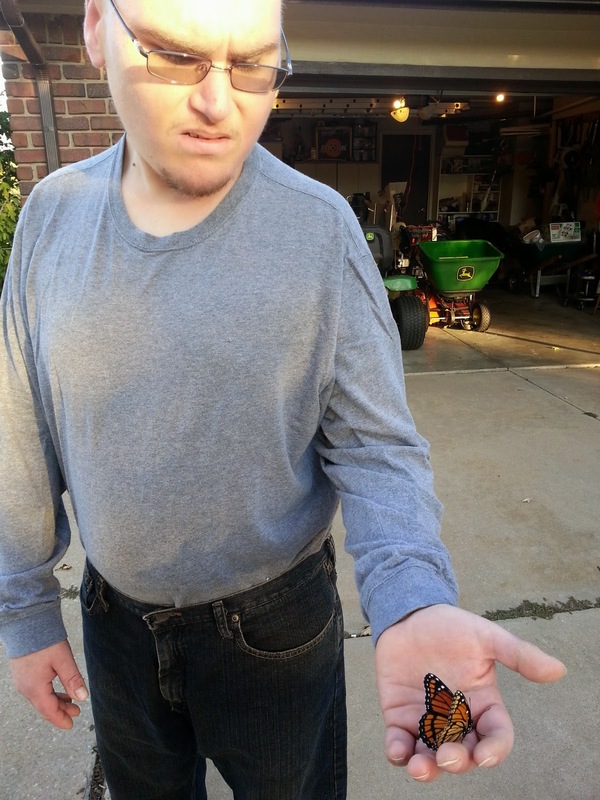 You see, last November I wrote a blog about how Aaron found a butterfly and how he wanted me to hold it. It was a special moment for me that taught me such a sweet lesson. Today I’m thinking of other aspects of that butterfly……who was first a caterpillar. I’m thinking of the day that we first heard Aaron’s diagnosis of Epilepsy. I remember how shattered I felt as I sat at my desk that night in Germany. Our little blond headed blue eyed son had what? Epilepsy? What does it mean? What WOULD it mean? And I cried, deep sobs of pain and acceptance. Nine years later……another doctor, another place, yet another diagnosis. Autism? Asperger’s Syndrome? What does it mean? What WOULD it mean? And again, when the children were asleep, I cried deep sobs of more pain and more acceptance. Pain comes naturally. Acceptance is a decision that I make. Acceptance is usually slower. It certainly has been for me. Maybe he’ll get all better with time. Maybe the seizures will go away after puberty. Maybe this new drug will do the trick. Maybe he can have surgery. Maybe the VNS will kick in. Maybe it’s not really as serious as all that. Maybe the autism will improve with this diet. Maybe those guys will be Aaron’s friend. Maybe Aaron won’t move so much and talk so much during church today. Maybe he won’t be grouchy when his bus comes to pick him up today. Maybe he’ll just love his day group. Maybe he can hold a job one day and be like everyone else. Most of the maybes don’t happen…….and acceptance slowly sinks in. Reality of life with Aaron has been slow going……very slow going. But it’s not the end of the world. It may the end of the world as we know it as far as our hopes for Aaron in certain areas……….but just like that caterpillar, there is beauty in this life that God has given us. 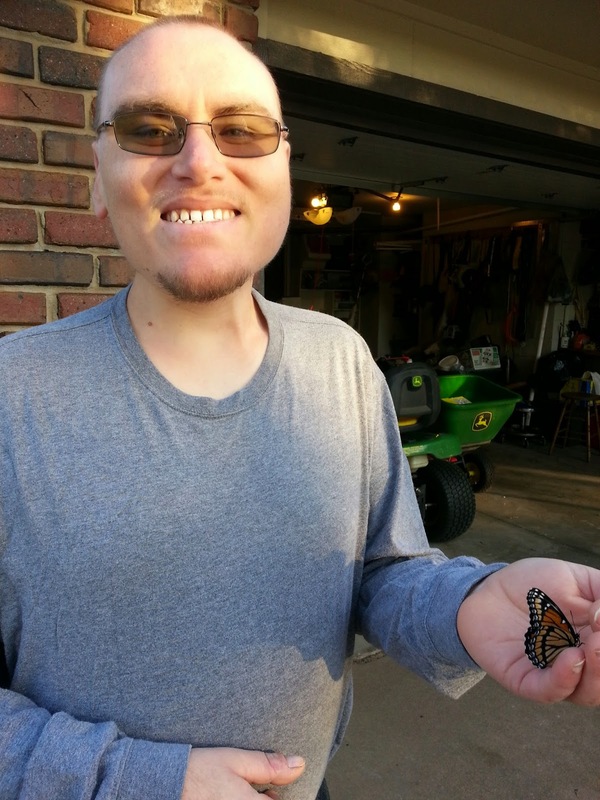 “What the caterpillar calls the end of the world, the Creator calls a butterfly.” I held a butterfly that day last fall as I stood outside with Aaron, and I hold a butterfly in my life as I look at Aaron. That’s because God is sovereign, and He has a plan for Aaron and a plan for our life with Aaron. It’s a plan of beauty, even when I can’t see it as such. I have to hold on to that truth on the bad days, the sad days, the worried days, the heart-rending days of this life. Oh, we have laughter and delight with Aaron but underneath it all are the concerns and the frustrations and the weight of always thinking about our special son. And I deeply feel the weight of so many other moms……friends that I love and friends that I hurt for as well as they fight this fight and live this life for their special children. I want to tell them that God is weaving a beautiful tapestry of their lives. They don’t feel it or see it any more than I do on many days, but God truly is a God of purpose and beauty. So we lift each other up, we cry together, we pray for each other, we try to encourage one another……and we trust our sovereign Heavenly Father even when He doesn’t seem to answer our prayers in the way we want. Acceptance…..of Who God is…..and how much He loves me and He loves Gary, and Andrea and Andrew…..and especially our special Aaron. I want to hug my other moms of special children…..Wendy, Goldie, Shikara, Cheryl, Trish, Louise, and so many others. I want to say that I may not have great words of wisdom, but I do have the truth….as do you…..that God is in charge of making caterpillars into butterflies. And He can…..He will………bring beauty into and out of our lives with our special children. Many of you have kept up over the past few years with the story of Aaron and Rosie. I will put links for my other Aaron and Rosie blogs at the bottom of this blog. Aaron and Rosie met at Paradigm, the day group that they both attended, and they developed a special friendship. Now Rosie attends another day group, but they still see each other for a short time at the end of their day, and they ride together in the van that brings Aaron home at the end of the day and then takes Rosie to her house. Aaron has to be told over and over not to give Rosie food or money or her very favorite thing in all the world…….crayons. He will do any of these things at any given opportunity. His favorite thing to do was to sit with her on Fridays at the theater and share his popcorn with her. They would do this every Friday, so when I first told Aaron that Rosie was going to a different day group, he thought for a few seconds and then said, “No theater?” I cried. And he didn’t see that, just like he can’t see what he does so often to my heart. For several days now, Aaron has told Gary and me about a new client at Paradigm. J. has come into Aaron’s world in a rather unwelcome way. He doesn’t mind new clients, and has learned a lot about getting along with new people. I don’t know if the Paradigm staff would agree with that, but that’s how it seems to us. Anyway, according to Aaron, the reason that he is rather unwelcoming of J’s friendship is because she told Aaron that her boyfriend had broken up with her……and then asked Aaron if he would be her boyfriend. Well, this has created a huge dilemma for Aaron. He has talked and talked about this situation with Gary and me. It seems so simple to us to follow the advice that we give to Aaron as we tell him to just not take J so seriously. Just tell her that he wants to be her friend. Just tell her no when she asks him to be her boyfriend. Just be nice to her but don’t………what was that? She told you to hold her hand? Yeah, well, just don’t do that either, Aaron. Aaron is so perceptive. Just yesterday he said, “Mom, J. is faking it. I said my stomach hurt and she said, ‘Let me hold your hand, Aaron.’” Gary and I laughed and laughed at that one, but it’s really amazing to think that Aaron knew J was using his stomach ache as an inroad to hold his hand. Way to go, Aaron! Another aspect of this boyfriend/girlfriend problem is that Aaron really does see Rosie as that one special girl in his life. He doesn’t like for her to be called his girlfriend or for him to be called her boyfriend, but he does see her as his one special girl…….who is a friend. Rosie’s parents, Louise and Leroy, and Gary and I don’t want to make Rosie and Aaron’s friendship a boyfriend/girlfriend thing either…..but we do enjoy the relationship they have. So along has come J and she is causing come conflict in Aaron’s heart. Just today Aaron asked Gary, “Dad, what do you think’s wrong with J? She’s trying to make me go away from Rosie!” And once again, Gary tried to explain it all to Aaron and give him some answers. His comments about Rosie are so sweet………so insightful. A couple days ago, speaking of Rosie, he said, “I found someone who likes me and agrees with me on things.” And don’t we all know that those are two characteristics that attracted each of us to our special someone? This melts my heart. We want Aaron to have that special someone in his life, on whatever level is best and suitable for both of them. Their relationship is sweet and it is typical for them, where they are in their special lives……and that is enough. That’s why today was a special day for Aaron and for Rosie, for Louise and for me. On Thursday Aaron stood in the kitchen while I finished cooking supper. He was once again talking about his rock and his hard place………Rosie and J. Then he asked, “Mom! 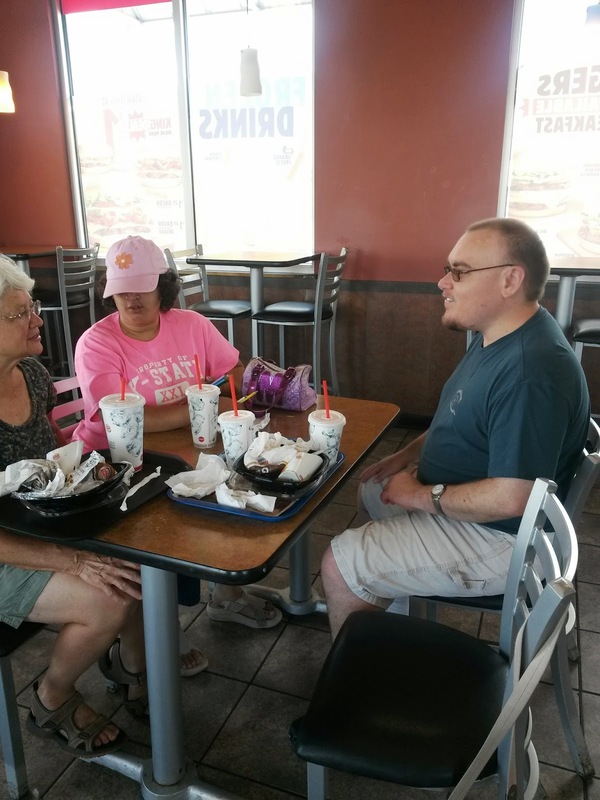 Can we go to Burger King this weekend with Rosie and her mom?” My first thought was to think of several reasons why we probably couldn’t do that, but the look on Aaron’s face and the pleading in his voice stopped me in my tracks. I thought of how much Aaron depends on us for his social life. He can’t drive and he can’t make these events happen without our help and our permission. How would I like to live that way? And I’ve seen more and more that Aaron is so perceptive about life and about people, much more than we give him credit for. How can I turn a blind eye and a hard heart to his desire for a normal “date” with Rosie? How can I not make that happen for him? So I quickly texted Louise and she quickly texted back, and soon we had agreed to meet at Burger King on Sunday at 1:00, Aaron and Rosie in tow. Louise said that Rosie was very excited when she saw Aaron and I pull up and then walk across the parking lot. Rosie and Aaron didn’t really greet each other, but both of them were talking up a storm……..not to each other as much as to me and Louise. As we ate our lunch it was like watching a tennis match. Back and forth, back and forth went the conversation. Aaron loves to talk, as we know, and Rosie loves to tell of things she has seen and places she has been and things that have happened. Rosie likes for her mom to do a lot of the telling, but she contributes plenty…….and Aaron rarely stops talking, loudly, so it was a lively lunch. It’s so interesting to see Aaron and Rosie together. Both of them are chronological adults but are so much like children when it comes to life and to friendship issues. They don’t mind having their shared lunch with their moms. It’s all they know and it’s all they expect……and want. They see nothing odd about it at all. I wonder what others in Burger King thought. I hope they saw it as a wonderful moment for our adult “kids.” Some normalcy in their all too restrictive world. Look at Rosie and Aaron smile! I’m so happy that I said yes to Aaron’s request, and I’m so happy that Louise took her time to bring Rosie to meet us for lunch. To meet Aaron for lunch! Being a parent is all about meeting the needs of our kids, and for us parents of special needs kids, the meeting of those needs may even extend into adulthood. That’s the way it is and so we may as well accept it and enjoy it when we can. As we drove away, Aaron was already planning a movie date. It’s a good thing I like movies! I hope Louise does!